Tea Party members are overwhelmingly Republicans!…..
Tell me something the Democrats, Republicans and I ….DON’T KNOW! That conclusion, backed by numbers from a new Washington Post-ABC News poll, also suggests that the tea party may have little room for growth. Most Americans — including large majorities of those who don’t already count themselves as supporters — say they’re not interested in learning more about the movement. A sizable share of those not already sympathetic to the tea party also say that the more they hear, the less they like the movement. Overall, the tea party remains divisive, with 27 percent of those polled saying they’re supportive but about as many, 24 percent, opposed. Supporters overwhelmingly identify themselves as Republicans or GOP-leaning independents; opponents are even more heavily Democratic. The new movement is also relatively small, with 8 percent of supporters claiming to be “active participants” — about 2 percent of the total population. But from a political standpoint, the most important cleavage is within the Republican Party. The percentage of people who say the Democratic Partyrepresents their personal values and is in tune with the problems of people like themselves hasn’t changed since November. The percentage siding with the GOP, however, has dropped by almost precisely the numbers now siding with the tea party. Daniel G and all the GOPer’s over at Politics1 where sooooo confident that Senate Majority Leader Harry Reid was going to go down in flames…..
Well they can think again….. 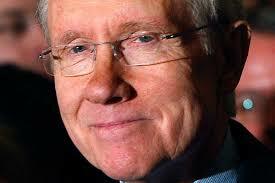 There is very…very good chance Reid will be right where he is come January…. thanks to the Tea Party in Nevada…..atta boy! Update……Is the Dog being too optimistic here?……I will give this lead a second thought after reading this……..Daniel might be right after all if Reid can’t get more traction with the voters……Median in Teaxs never rose to her billing…..and Perry sweep that race……if the Tea Partier doesn’t catch on…..Reid would still be in trouble…. Daniel G on the Nevada Senate and Governors Races…….and the Tea Party…..